Anyone from Europe will tell you that what Americans generally consider “bread” is more like a loaf of bland nothingness with the consistency of a sponge that can be mushed together into something resembling playdough. To be fair, it is okay if you get some multigrain bread and toast it to give it some firmness and make sandwiches, but other than that …. Artisan bread is a step up and brings a bit more taste and firmness. It can be found at various stores, we generally get some from Cub or Trader Joes. But the best bread we have found till now is at a local “breadsmith” here in Minneapolis / St. Paul. They truely sell real bread. Yaaaay. So if there is a breadsmith near you, drop in and have a look, might be you find bread like you have never tasted before. We visited the Minnesota Landscape Arboretum last week, here are some impressions we captured with the camera …. For the release of their latest game Portal 2, Valve went to great lengths marketing wise. They set up an “Alternate reality game” (ARG) with tips and puzzles hidden in 13 independent games (to promote indie games). Some of the games even added extra levels just for the ARG. Solving puzzles, finding passwords, and triggering special events led to the possibility to gain “potatoes” as a sign of progress. If all 36 potatoes were found in the 13 games involved players got a golden potato. 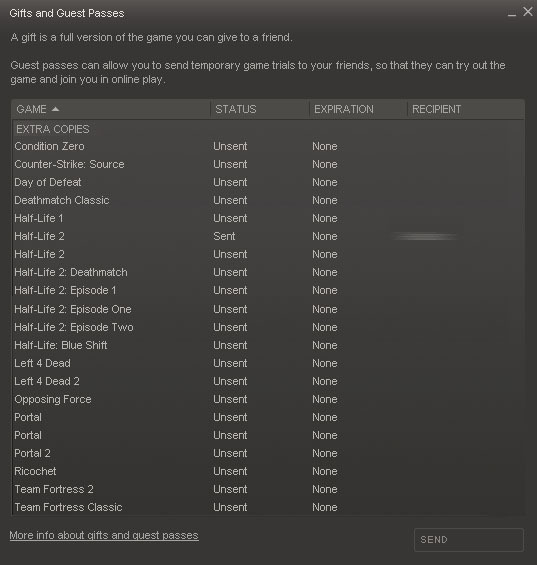 After the ARG was solved by the community, Valve added a countdown a few days before the release of Portal 2, allowing the community to get Portal2 to release early by collecting potatoes and (in the end phase) playing the 13 indie games. Last Friday Valve announced in the official blog “There’s also still time to collect all 36 potatoes. Anyone accomplishing this feat by the time Portal 2 launches will receive a very special, non-hat-based reward.” An extra incentive for people to play the games involved and collect the potatoes. I spent most of the last days collecting all 36 potatoes, got the last one just hours before the deadline. Today everyone with a golden potato got the reward, a valve complete pack and a copy of portal2. I’m honestly impressed. I never would have expected them to not only give out all their previous games ($100), but also a free copy of their latest game they just released yesterday ($50). Some more pictures from around here. Let’s start off with the local zoo …. Steffi flew in on the 15th, and I came over a week later. And now our new home is in (the cold) Twin Cities 🙂 Our internet conenction isn’t going to be installed till Feb 1st (along with phone and TV), so I don’t have much to do except for cleaning the appartment, assembling furniture (IKEA is just around the corner) and shopping … and of course keeping an eye out for interresting jobs here. I’ll keep you all posted on how things are going here, If the sun ever comes out I’ll go out to shoot some photos. Yesterday Steffi and I went geocaching, I took some photos while we were underway …. I never got around to posting it, but a few weeks back the hard drive of my PC with Windows on it died … a little bit. Technically a large chunk of the harddrive is simply unaccessable. after poking and pushing I at least got windows to boot up again, but a large part of the software was dead. I bough a new drive and went through the fun process of installing a fresh windows, patching it, and then installing all the software again. I didn’t get around to installing my video and picture software on the new windows until this morning, and it turned out to be lots of fun. Due to pure luck I found the license key for sony vegas (it is shown in the splash screen when starting up, shortly before it crashes due to my harddisk malfunction). Any Photomatix was where I keep most licenses stored. But my Photoshop license was more of a challenge. Adobe only allows 2 activated copies of the software per license, activated copies are bound to hardware … you probably see where this is going. I couldn’t deactivate the old installation since the harddrive was kinda dead, and the new installation says “different hardware (new harddrives), must be a different computer”. Yay, fun. The bright side was that the support was easily contacted and they could reset the activation counter (after lecturing me about using it on “2 computers” and deactivating, bla bla bla). I learned one thing: the more expensive the software, the more problems you have with licenses. A shame I never liked Gimp for photo editing. Wife did some baking tonight, so I whipped out the camera and took some shots. Unfortunately I noticed that the flash hot shoe seems to have gone unresponsive after a fall a few weeks ago, but using the built-in flash as a commander to control an off-camera flash still works fine. We shot over 600 photos on our cruise. Anyone who missed it on Facebook: we visited Savona (Italy), Barcelona, Palma de Mallorca (both Spain), Tunis (Tunisia), La Valletta (Malta), Cantania and Rom (both Italy). Anyway, here is a selection of some of the photos. Took me the better of the day to sort out which photos were worth while posting, and then post-processing them. I always shoot in RAW + JPEG. For normal point-and-shoot vacation stuff I’m generally satisfied with the JPEG the camera spits out. But I would never shoot only JPEG. The additional information of RAW shouldn’t be underestimated, and to be honest I often tweak around. It makes a difference if you are working on the original RAW data, or if you are working on the JPEG copy the camera has already processed. Up till now I’ve been post-processing my images with Adobe Bridge and Photoshop CS3. Since I was planning on post-processing a whole load of pictures I decided to see what software there is out there to streamline the work flow a bit (Bridge and CS3 do the job, and the raw converter in CS3 does offer a wide variety of options, but it is still tedious switching to be switching between both programs and working on multiple RAW images at the same time). While I was away, Adobe released Lightroom 3, so I checked out the reviews and it sounded good. I downloaded the 30 day trial version and to sum it up my experience so far … I’m impressed. I haven’t worked with Lightroom previously, so I can’t say how much has changed in this version. But I really like the details that make life easier when handling collections of images. Being an Adobe product it also offers interfaces to various Photoshop functions (I only own CS3, I could imagine it offers more options if you have the current version CS5 installed). I could go on and on with things I like about it, but I’ll just sum it up and say: It really streamlines the work flow of post-processing photographs from import to print/upload/web/presentation and if you are shooting RAW it has a whole lot of fun stuff to play around with directly built in. Since I shoot with a Nikon D80 that tends to produce a fair amount of image noise if I go past ISO 400 I liked the noise reduction features of Lightroom, both color and luminance noise can be reduced greatly with sliders for fine tuning. It’s a good piece of software, and when the 30 day trial ends I’ll probably go buy it. I finished up my “grid clicker” script. it is intended to simplify testing of games where you have to click certain patterns (a grid). Typical facebook games like farmville or funfari are great examples of this. just download the file (here is the sourcecode), execute it, and an eye should appear in your task bar. Double clicking on the icon in your task bar will start the script, just follow the instructions and everything should be fine. I haven’t posted anything here in a while. Mostly I’ve been busy preparing a photo-shoot and -documentation of a wedding of friends. As a photographer you will always notice things, when looking at the finished fotos, where you say “hmm, maybe a differnet aperature/iso/flash/exposure setting would have produced an even better result”. but all in all I’m satisfied with the results. Spent a day this week driving around and taking random photos …. A few weeks ago we were in the Schwarzwald for a few days, and since we got a fair amount of snow while we were there I took some pics. I’ve uploaded my 30 favorite here …. We went for a walk through the snow and some sledding today, here are the pics i shot …. I made some of my cookies this evening and used the opportunity to take some pictures. The lighting wasn’t perfect, so everything has a slight yellow tint. I decided to leave the pictures that way instead of trying to correct the problem in Photoshop. Yesterday we made a short trip to the castle in Schwetzingen, while we were there I took some photos around the castle. I had Monday off work, so we went hiking in the Black Forest (southern Germany) the last 3 days. The first day we started hiking around Blumberg (I managed to twist my knee after a few km, didn’t really make things easier), then we took a steam locomotive (Sauschwänzlebahn) up the hill and hiked back to the car. Afterwards we drove up to Titisee where we booked a hotel for 2 nights. The next day we drove over to the Wutachschlucht and hiked a very nice trail. Since the weather was good and it was a Sunday there were a decent amount of people hiking. In the late afternoon we finally arrived at our destination, sat down and rested our feet before we took a bus back to where we parked the car. On the last day we were a bit tired for hiking the last 2 days and the weather was getting a bit rainy, so we decided to take the scenic route home, and stop by waterfalls and ruins on the way.